Thomas Alva Edison never stopped doing. He was granted 1,093 patents for his inventions–more than any inventor ever. He filled more than 3,000 notebooks with ideas and sketches. He invented the first practical light bulb, the phonograph, and the kinetoscope. In so doing, he created the foundation for the modern power grid, the recording industry, and the motion picture industry. Tireless Tom Edison invented the future. Combining lively text, rare period photographs, and Edison’s own words, Delano paints a memorable portrait of this prolific American genius. 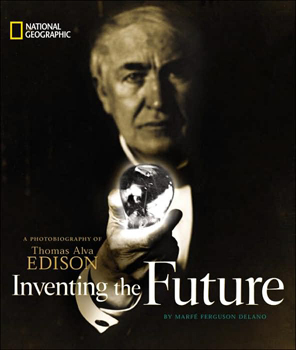 The foreword by Edison’s great-grandson adds a personal note to this exciting American success story that will spark kids’ interest in science and inspire a new generation of inventors.